This Sunday we would like to inform you about a strange achievement attained by researchers at New York University. 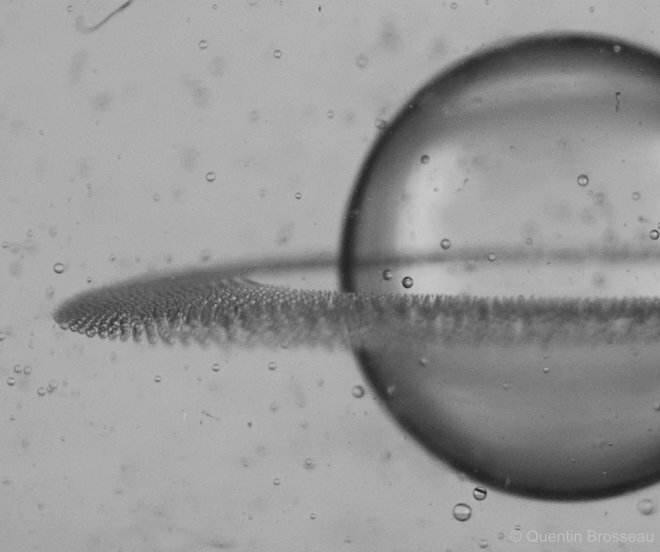 By electrifying tiny droplets, these scientists have created miniature versions of the ringed planet Saturn. Normally when a drop of electrically conductive liquid is exposed to an electrical field, this drop forms two electrically charged poles. Previous research has shown that these poles can get pulled towards the electrical source, creating cone shapes. Should this pulling affect get strong enough, the tips of the cones begin to spray jets of droplets. This experiment essentially took it one more step by putting these drops of liquid in even more electrically conductive fluids - such as silicone oil in castor oil. In this even more conductive fluid, these drops took on an electric charge that was the same as the electrode. Since the electric field was so strong, this strange 'Saturn' phenomenon took place - something the researchers were not expecting to happen. Other than its aesthetic value, this discovery could also help researchers develop new ways of generating microscopic and uniform particles often used in products such as drugs, inks and cosmetics.